"Romney has got to do something that does not come naturally to him: appeal to voters—specifically, one key demografico"
Colbert offered Romney some political advice on Wednesday's edition of "The Colbert Report." Presumptive Republican presidential nominee Mitt Romney has a well-documented "Latino Problem." The former Massachusetts governor's positions on key issues—illegal immigration policy, deportation practices—have reportedly alienated many Latino voters. According to a recent Fox News Latino poll, Pres. Obama has the backing of a whopping 70% of Latino voters, while Gov. Romney nabs just 14%. Fortunately for Romney, Comedy Central's Stephen Colbert knows how to fix the candidate's "Latino Problem" as the general election heats up. 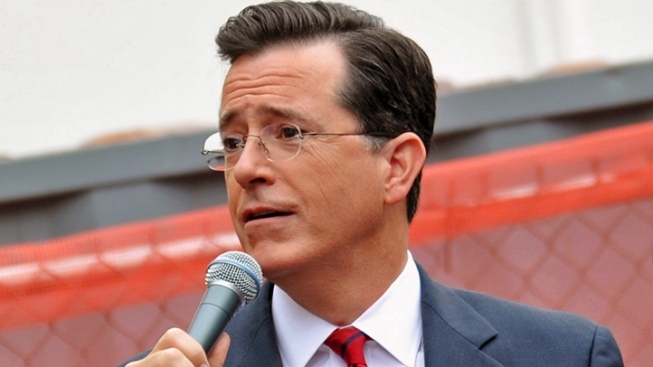 "I believe that Romney's got a shot because of his Hispanic roots that run deep," Colbert said. The late-night host reminded viewers that Romney's great-grandfather and grandfather lived in Mexico, and his father was born there—"with young Mitt strapped to the roof of his car," Colbert quipped, referencing the semi-scandal that has "dogged" Romney throughout the GOP primary race. "Back in 1885, Mitt's great-grandfather—Miles Park Romney—emigrated to Mexico to escape religious persecution of Mormons. Sadly, the U.S. government simply would not leave Mr. Romney and his wife, and his wife, and his wife, and his wife, and his wife alone!" According to Colbert, Romney has a chance to score Latino support by playing up his heritage—and rolling out an advertisement produced by Colbert's very own Super PAC. (In other news, that particular running-gag helped earned Colbert and his writing staff nab a coveted Peabody Award on Wednesday).